World Peace Cookies might be one of the first recipes I ever bookmarked. I remember reading the description, reading the ingredients and just drooling. They sounded so good, so decadent. For some reason though I never made them. I would come across the recipe in my bookmarks every so often proclaim "ohhh yeeeaaah" and then promptly forget about it. But I had to make something chocolate for christmas (special request from my aunt) and I didn't feel like making brownies again. It was finally time for world peace. This is another recipe I didn't want to play with. However, my Christmas menu was severely lacking in peanut butter, so instead of chocolate chips, I went with peanut butter chips. Peanut butter and chocolate, how could it go wrong? ("I'll be right back" :) ). I was so determined to make this recipe as Dorie Greenspan intended that I even looked up her ingredient weight measurements. At which point I was both glad I did as well as a bit nervous. I typically adjust the sugar in cookie recipes. No surprise that I usually find most recipes have too much. I was concerned about the amount of sugar used in this recipe but I wasn't going to argue with Dorie Greenspan (I should note that she uses 240g per cup of packed light brown sugar). Besides with the amount of butter in the recipe, I supposed it would be okay. This recipe also uses a heavier hand than I do for flour at 140g per cup (one of a dozen accepted values) but despite this I read a lot of comments about crumbly/dry dough that did not hold together. To me this means that either they weren't using enough sugar or they had too much flour. Following the recipe by weight (the only weigh to go :)-- see what I did ?) I had absolutely no issues. The dough was perfectly soft and manageable. I was also having some anxiety about potentially over baking the cookies because I had cut the cookies a bit thinner in order to get a few extra. Honestly, for a recipe with so much butter and sugar you don't get much out of it. A smarter person than I would have made longer logs of dough and cut the same thickness of cookie, but that person wasn't around. My initial assessment of the cookies was that they were too sweet and not chocolatey enough. I was shocked. All I had ever read was how incredible these cookies were. They were chocolatey, just not reaching the decadent heights that I had expected. It almost seemed that the sugary sweetness was muting the chocolate flavour. Not to mention that I could barely taste the peanut butter. And having not reread/remembered the cookie's description (or thought about the ingredients ) I had expected it to have a brownie like texture. I mean, doesn't it just look brownie-y? Instead, the texture was light, crumbly, and crisp. No complaints though, it was actually a pleasant surprise. The sweetness seemed to mellow after a day, or maybe the chocolate flavour became a bit richer. Though still sweet, I could finally taste the natural saltiness of the cookies and the peanut butter chips; both playing a larger part in balancing out the flavour. 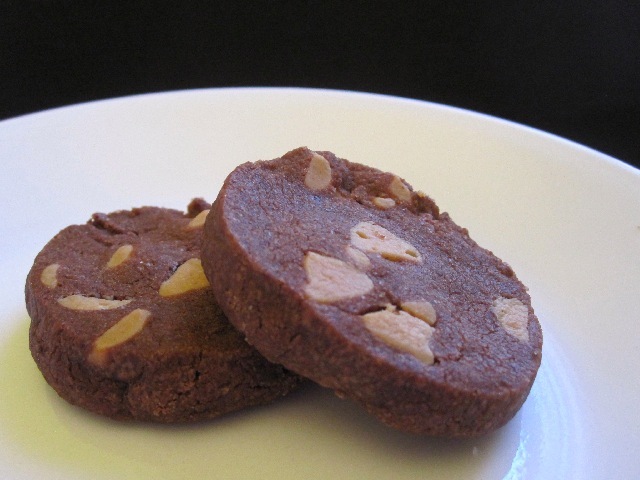 A good quality bittersweet chocolate, as the original recipe intends, would also have served to balance the sweetness of the cookie. As well, it would have added that extra dose of chocolate decadence that seemed lacking. I'm not complaining about my decision to use pb chips, the combination of chocolate and peanut butter is tough to beat; I was just expecting a richer chocolate flavour from the cookie itself. And don't get me wrong, the cookies were good, better the next day and the day after, but I had very high expectations. Perhaps they really do need the added chocolate to take them over the edge. I also think a minor adjustment to the sugar content would make a world of difference. In my opinion there's just too much of it. For some reason I also kind of feel like having the add-in be such a major contributor to the overall flavour of the cookie is a bit like cheating. But I suppose this isn't a good argument, recipes are meant to be followed after all. Maybe this is another one that I should make again exactly as it was intended and see what I think. I really did enjoy the cookies and the peanut butter; but he warned that without the chocolate chips, the flavour isn't as you would expect. I still recommend trying them, and I would also recommend trying them as I made them because they are quite good. My version might not encourage world peace, but they're definitely not going to start any wars :). In a medium bowl sift together flour, cocoa powder, and baking soda. In the bowl of a mixer add butter and beat until creamy. Add both sugars, vanilla and salt and beat until fluffy and smooth, approximately 2 minutes. Slowly add dry ingredients to the bowl mixing until just incorporated (this is not how it is described in the book, but I don't expect it matters much). Remove from mixer and fold in peanut butter chips. Gather dough on work surface and divide in half. Roll out dough to approximately 9 inches in length or 1 1/2 inches in diameter. Repeat with other half of dough. Wrap dough in plastic wrap and chill in fridge for at least 3 hours. Preheat oven to 325F and prepare cookie sheets with parchment paper. Remove dough logs from fridge and slice 1/2 inch thick pieces (or slightly thinner) and lay flat on prepared cookie sheets. Bake for 12 minutes (if you make your cookies a little thinner you might want to take them out a bit earlier). Note: cookies will not appear to be done when removed from oven. If you made your cookies a bit thinner, allow to cool on cookie sheet for 2 to 3 minutes before moving to rack to cool completely. If you made your cookies per recipe (1/2 inch thickness), allow to cool on cookie sheet until they are just warm before moving to rack to cool completely. I had a similar reaction to those cookies--I kept saying to myself "you know, I should really make those..." and never did. The name attracted me more than the recipe (and the story behind them)--I've since read lots of people who had a similar 'meh' reaction to them, particularly the texture. It's interesting how certain textures/flavors/ levels of sweetness can be very regional and very particular--like you, I often find recipes are too sweet, and I'm not a huge fan of very insubstantial, light crumbly cookies (although I have made a butter cookie recipe with that texture that I liked). I love the name and the cookies!! Damn my peanut allergy! @Mary -- I'd still recommend them, though if you're turned off by the texture then you probably won't like these ones either. I really feel like I need to give them another chance to blow me away. @Iva -- Replace the pb chips with chocolate and you'll get that chocolate boost I thought was missing. Though you have my greatest sympathies about the allergy, I don't know what I would do without peanut butter :). And thanks for commenting! :). That's exactly how I felt about those cookies. They were very good, but I'd rather have big, soft, chocolate cookie or even a good piece of well-made shortbread. BTW, Adam. My daughter turned in her science fair project today and it revolved around volume vs. gram weights of flour. I won't say much more about it until the fair is over. That might not be fair... I'd rather have a good piece of shortbread over almost anything :). @Adam--you don't have SCIENCE FAIRS in Canada? Oh my goodness, you nice noncompetitive Canadians! (In everything except hockey). We in America can turn ANYTHING into a competition, can't we! My 11th grade experiment on plants totally whooped the butts of my botany competitors! And good luck, Emma!